Sewing unplugged!Tracy is making morsbags with her little old hand crank sewing machine outside the coop in Alsager RIGHT NOW! 1) Who is in your pod? It is basically me. I have a few friends who come to visit sometimes and make bags whilst we drink tea and chat. Also, 5 (out of the 6) of my children have made at least 1 bag each. I will get the youngest one sewing soon. 2) When/where do you sew morsbags? I am lucky enough to have a sewing room at home so most of my sewing is done there. As I live in Leicester, I go to our fabulous morsroom most weeks and help out at events. 3) Where did you first hear about morsbags? 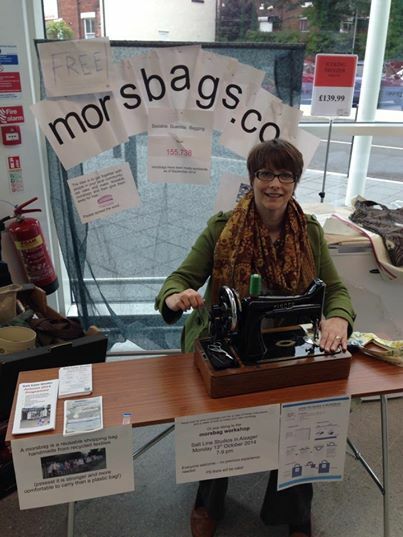 I first heard about morsbags when there was an event at our local Environment Centre. I didn’t actually go to the event but looked at the morsbags website and made one at home. When I saw there was going to be another event at the Environment Centre, I went along. We still have events there now. 4) Did you think about your use of plastic bags before? I didn’t really give plastic bags much thought before. I think I did try and use bags for life but it wasn’t something I felt that strongly about until I discovered morsbags and read up on it. 5) What type of sewing machine/s do you use? I use a Brother sewing machine. It is the same as the ones that we use in Leicester for our events. I also have a beautiful old Singer treadle machine that belonged to my husband’s grandmother but I’ve never actually sewn with it. 6) Please give 3 adjectives to describe your first morsbag. My first morsbag was wonky, functional and inspiring! 7) What was the most unusual or satisfying thing you’ve made a morsbag out of? The most satisfying thing I’ve made a morsbag from was my oldest son’s old space print curtains. I made him the curtains when he was about 6 (he is now 17). I recently used them to make small morsbags for my youngest son’s party bags. Giving all the children at the party little morsbag made all the Mums ask about them and I bagged them too! 8) Who was your first bagging victim? My first bagging victim was my Mum. 9) What’s been your finest morsbag moment? I would like to confess about my morsbag diary. I am not a particularly organised person but from day 1, I have kept a list of every morsbag I have made. I know when, where and what fabric it was made from and who (or what event) I gave it to. It may seem a little obsessive but I’m really glad i have kept this record. I’m very proud to be part of the morsbag family. 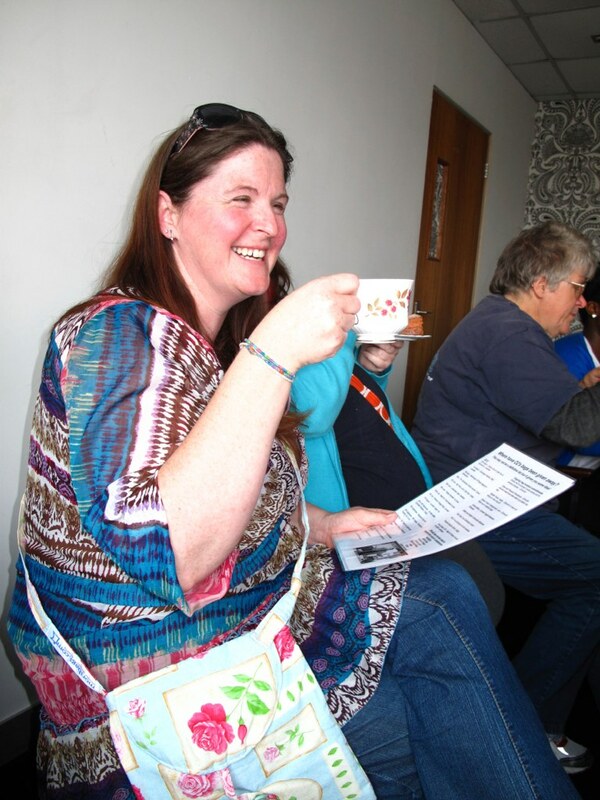 We are very fortunate in Leicestershire that we have Rosie (Offcuts) who is so passionate about the cause that she motivates, organises and encourages so many morsbag events and opportunities. I have met and become friends with people that I wouldn’t have met if it wasn’t for morsbags. I love going to events, taking part in handouts and spreading the morsbag word. Is there a superstar you adore from afar, a memorable teenage crush, a singer, a dancer, a rock and roller, a Great British Sewing Bee contestant, a sportsperson, a reality TV star that makes you want to scream?…. Basically if there is anyone in the public eye you can use to inspire you to make a celebrity themed morsbag – then you could be in with a chance of winning a fantastic prize, AND making a SUPER morsbag! Please post photos of your superstar creations by midnight on the 15th of June. Even if you don’t win (or even if you do! ), perhaps your super duper morsbag can be given away to the celebrity you were inspired by (unless they’re no longer alive) so enjoy the planning and sewing… Good luck! We had a really successful handout in March – well done everyone! So are you ready for the next handout in May? We’ve chosen Monday 26th of May and thought it’d be a great way to give everyone something jolly to do on their Bank Holiday! Mums are the best, right? So how about making her a very special morsbag that she’ll treasure and use instead of plastic bags…. or how about sitting down and making a morsbag with your children? Adopt a mum at the local care home and surprise someone by giving her a thoughtful morsbag. Make a Mother’s Day themed morsbag and post a picture here on the forum to be in with a chance of winning a fabulous morsbag ‘kit’ including fabric donated by HRH Prince Charles from the Royal Palaces – wouldn’t that be a quirky and totally original gift for someone’s mum? Please post photos of your yummy mummy creations by 9am on the 30th of March. Even if you don’t win (or even if you do! ), your motherly morsbag can be given away as a lovely gift to a mum somewhere, so enjoy the planning and sewing… Good luck! We had a really successful handout in January – well done everyone! So are you ready for the next handout in March? We’ve chosen Saturday 1st of March and thought it’d be a great way to give everyone a Spring in their step! New morsbags website – thank you very much Big Lottery Fund! Macs bags is the Pod of the Fortnight! Sue, Caroline, Anne, Carla, Olive, Jennifer, Cath, Veronica, Carol, Jacqui, Pat, Wendy and Allison who does the ironing. Let’s not forget our teaboy, Mike… We find making morsbags in a group more satisfying as we can chat and exchange ideas – even if we can make them faster on our own! Mostly we make morsbags in our own homes but we meet on Wednesday once a month at Sue’s house. Also on various occasions we meet up at either Jacqui’s or Wendy’s houses on a Saturday for those who go to work. Early on we realised that alcohol and trying to sew a straight line does not work….shame! Wendy’s son Bernie (Bernies bags pod) was staying with her for 15 months and persuaded us to start a pod with members of Marden Arts and Crafts Society. Yes, we did, but not to the degree of helping to do something practical about it. Some of us used the strong hessian bags, others loaded the shopping straight into the car, but the plastic bags were there so they got used, but not anymore! Our machines range from a Bernina, Singer, and Toyota Super Jeans to a very basic Janome. Satisfying, colourful and we were pleased. We find all the bags satisfying to make because we are lucky enough to be given fabric that would have normally gone to landfill. However, making a bag out of material donated by someone who has previously been bagged with one of our morsbags is great. We’ve also appliquéd shapes onto plain bags to use up odds and ends of fabric and printed paw prints onto them for a dog show. We have also made special shaped ‘bottle bags’ & ‘baguette bags’ which have gone to France. In general we love the look of astonishment when people find out that morsbags are free! Our best moment though was celebrating our 2000th morsbag with the fantastic cake made by Sue. These 2000 bags have been handed out to people in this area and there are still people who say “What are Morsbags?” So, lots more bags to make. Eric Clapton and ANY person at the checkout who uses a plastic bag for only a couple of items. 11) Future plans for your pod? We are looking forward to the party for our 3000th bag and will continue to visit small groups to show them how to make their own morsbags.